Year in Review 2015 - Top 15 Travel Favourites! The year 2015 has been an important one for our little family! We started chasing more dreams than just one! We had some incredible ‘new starts', not even to mention that we fell pregnant!! New addition to the Wanderlust Storyteller's family is ‘in progress'! Our second dream of traveling to more locations – more often, kinda goes hand in hand with our first dream! Our blog is helping us to achieve travel on a more regular basis! And since starting our blog in June, we have managed to travel to some incredible destinations! I love looking back at the end of a year and reflecting on what I have achieved. Take time to be grateful for all the things that went right in your year and take the take to be grateful that you overcame all those challenges and obstacles along the journey! So before we start planning for 2016, this is our reflection! 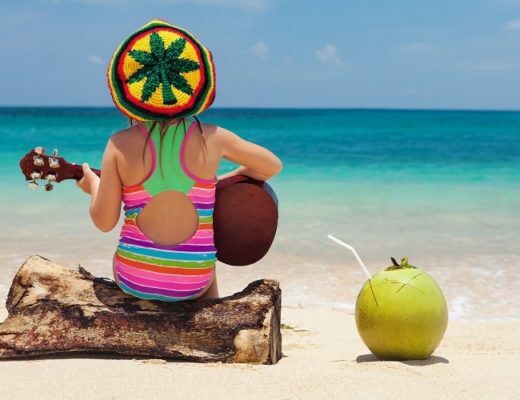 These are our top travel favourites from 2015! 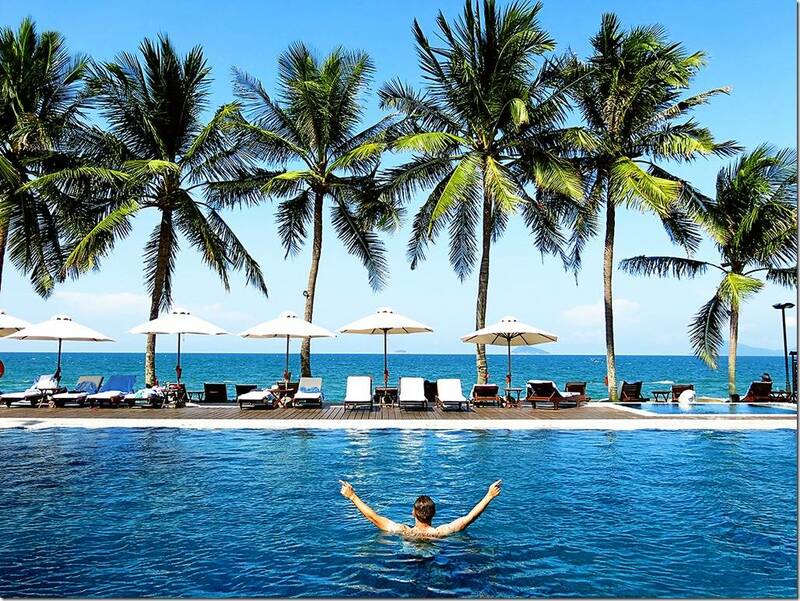 We fell in love with this palm tree lined infinity pool at Victoria Hoi An Resort & Spa. It was so hot on our visit to Hoi An (Vietnam), that we had to purchase an umbrella, we were so desperate for some shade whilst wandering up and down the streets of Ancient Town. So this pool, gave us a little relief! Especially when they threw in big chunks of ice for their guest to tumble around with! If you would like to read more about this incredible resort, hop over to our post ‘Checking in to the ultra luxurious Victoria Hoi An Beach Resort & Spa’. If you would like to book a stay at this resort, click here*. Whilst this resort was not necessarily our favourite resort of the year, it definitely topped the ranks for most impressive setting! 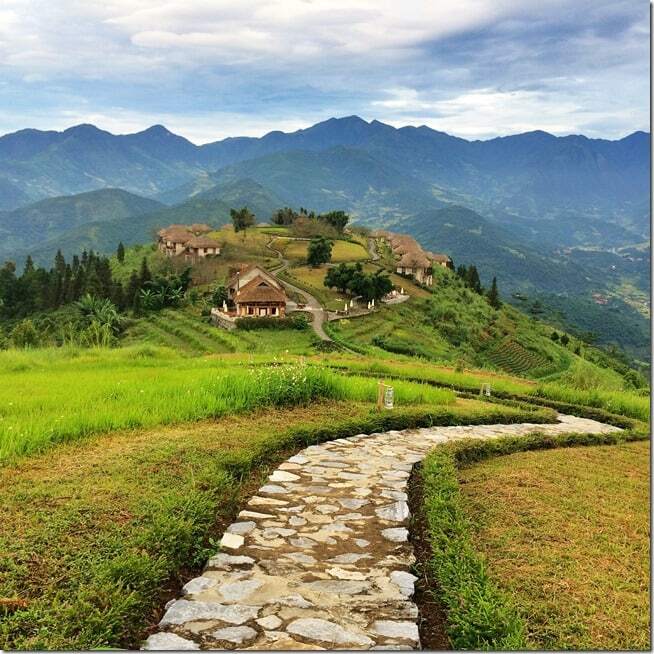 This resort is built on a small hilltop, located deep in the mountains of Hoang Lien National Park (Vietnam, about 45 min from Sapa). 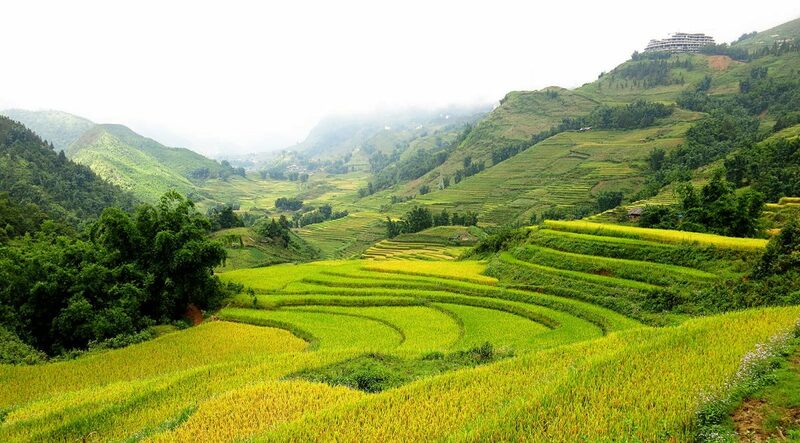 No matter where you are in this resort, you will be amazed by the dramatic views of mountains and valleys, rice paddies together with scattered minority villages along the mountains. It was so hard to absorb it all in, definitely felt like something from a movie! Blog post for this one is still in the making, but if you would like to book a stay at this resort, click here*. 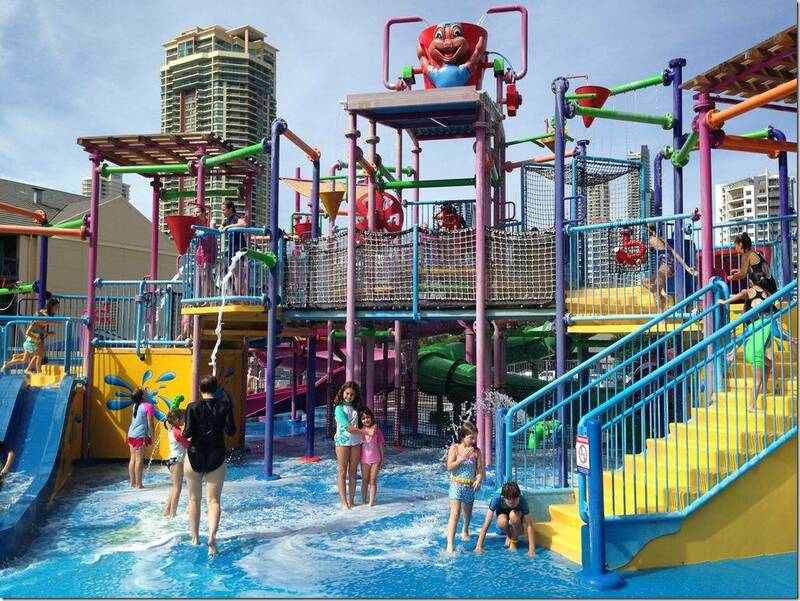 Hopping to the warm sunny Gold Coast in Australia, this resort was definitely the favourite one for our kids! Nestled in the heart of the busy Surfers Paradise, you will find a piece of paradise, especially designed for families. Here you will find water themed play parks, together with children’s playgrounds, fun kids activities, a kids club, an ice skating rink and much much more! It truly is a perfect place to relax and watch your little ones rush around and play. It is one of our family favourites! And I think it might be time for a return visit! If you would like to book a stay at this resort, click here*. Our favourite beach of the year; An Bang Beach in Hoi An Vietnam is definitely one to check out! We escaped the Ancient Town heat and found ourselves here, lazing around on the beach lounges, chilling out under one of the grass pergolas. Sure the beach hawkers annoyed us on a few occasions. Yes the water in the ocean was truly more like soup and not refreshing at all! But we enjoyed a few hours here, sipping on our icy cold cocktails and simply enjoying the views! 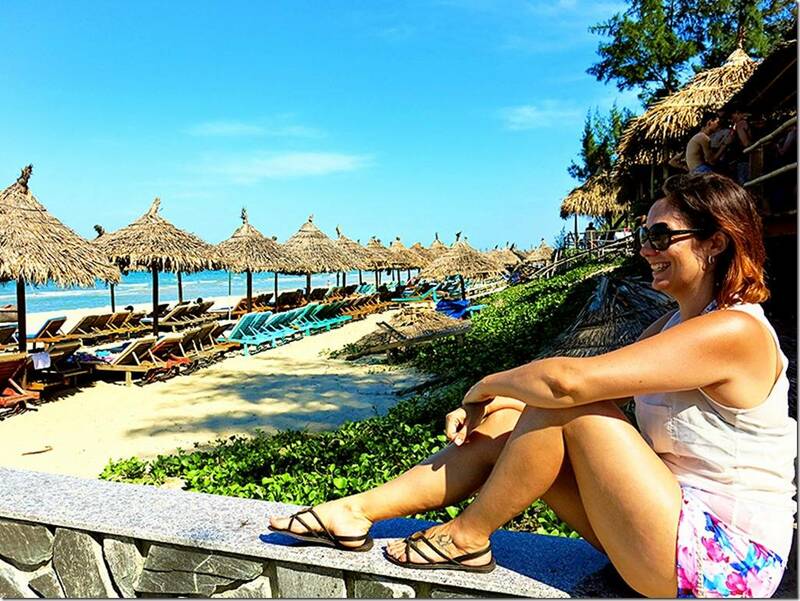 If you would like to read more about this particular beach, why not hop over to our blog post ‘An Insanely Awesome day Relaxing on Hoi An Beach’. I think a view like this, so impressive, so unique is hard to beat! The climb up to the top, around 400 steps (I think) was challenging, but this view is definitely worth the pain and suffering! Kind of like a life lesson? Nothing worthwhile in life is achieved by taking the easy road, the challenges and hardship along the way is what makes us appreciate the final destination so much more! So never fear those obstacles! It is time to conquer them! 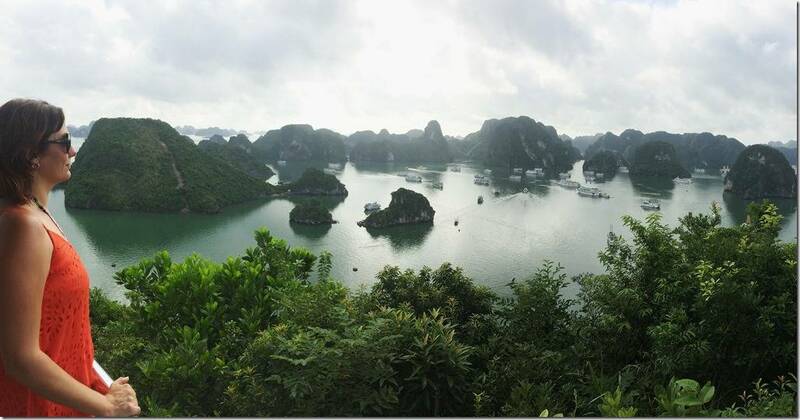 Ha Long Bay (Vietnam)! What a truly spectacular place!!! Our post on our incredible cruise here will be coming your way in 2016 and I can’t wait to tell you about our sensational time here! Truly, if I could rewind to this moment …. I would! 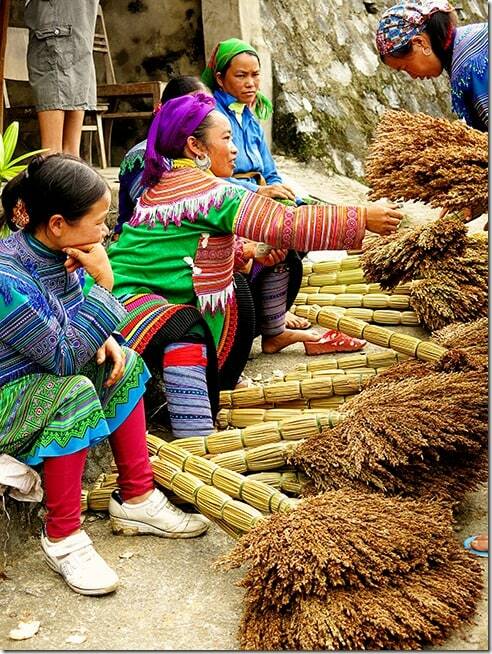 The Bac Ha markets in Vietnam is truly special! Here you will find traditionally dressed minority groups sell and trade their goods. A very crucial way for them to live and get hold of new items or livestock! Every part of the market is dedicated to something specific, whether it is their traditional dress-wear, fruit and veg, livestock and animals, butcher or handmade goods such as these brooms in the picture above! Our tip is to get to these markets earlier in the morning to avoid the tourists and get a more authentic feel of how things are done! We were told by our guide, that only the rich can afford to purchase a buffalo, funny concept to us! Life is so different there and it was truly special to observe and take in the stories of what typical life is like for these awesome people! The markets is off-the-beaten path, but we promise it will be worth the effort! 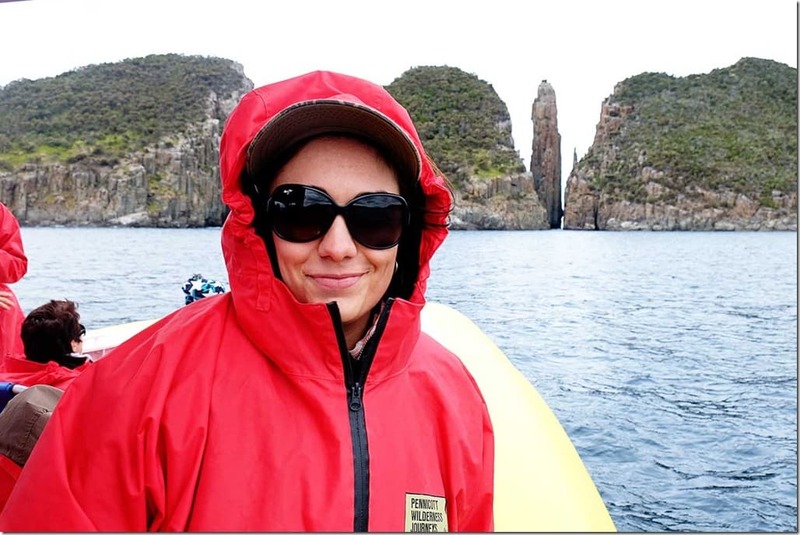 Our favourite activity of the year, was a recent wilderness cruise with Pennicott Wilderness Journeys. Whilst it was absolutely freezing cold out on the water, this cruise took us past some of the most incredible coastal features that I have ever seen! Not only that, but the abundance of wildlife on this cruise will simply blow you away! Highly recommend this one when you are exploring Tasmania in Australia! One of our favourites! For more information, hop over to our blog post, ‘An Award Winning 3 hour cruise with Pennicott Wilderness Journeys’. I don’t think there is a transport mode that we did not have a go at this year! We have been on taxi’s, busses, mini van’s, scooters, boats, trains, 4WD’s, planes and I’m sure I am missing a few! 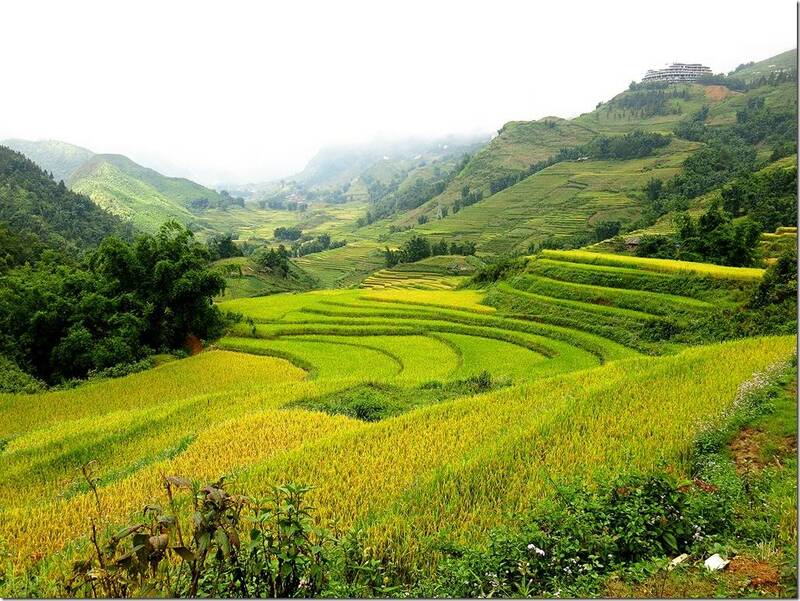 Out of all of those, I think the most adventurous one we went on was the overnight train to Sapa. 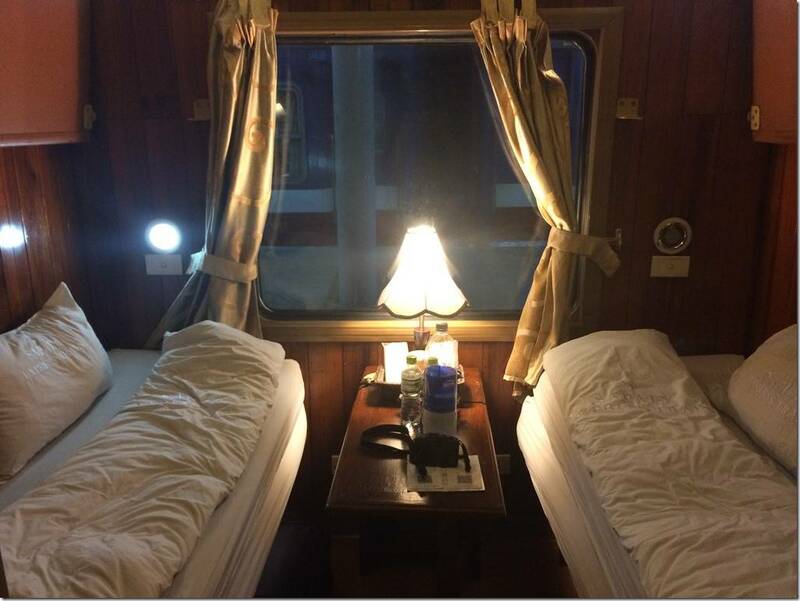 Don’t get me wrong, our cabin as seen in the photo above was very comfortable and luxurious for Vietnamese train standards! But when you are stuck on a train that is pretty darn old, your night is sure to be one filled with adventure! The noise from various chains smacking about, the mere feeling of thinking that you are going to de-rail at any moment! Let’s just say that not a lot of sleeping happened on this train, despite taking a good dose of sleeping tablets I still arrived pretty bleary eyed at the other side! Thankful to be alive! It sure was a memorable trip and one I’m glad we took, but gosh I was thankful for the express bus back to Hanoi instead!! Whilst in Vietnam (I’m sure you can tell by now that this country was a hot favourite of ours!! 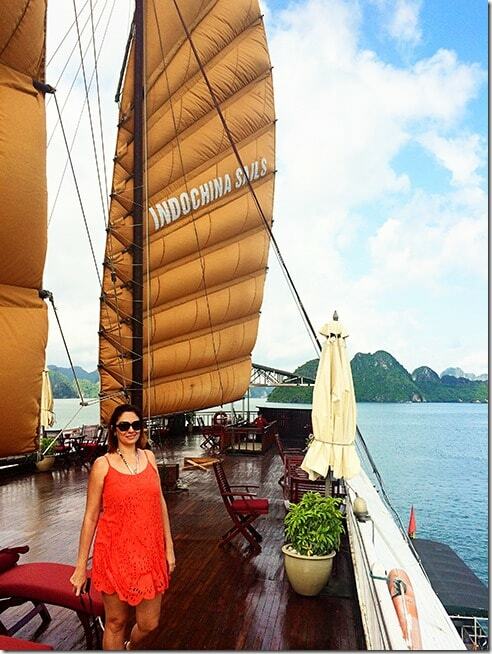 ), we treated ourselves to a pretty luxurious and special Halong Bay 2-night cruise with Indochina Sails. Gosh it was glorious! So relaxing, so picturesque and just totally divine! We loved the boat, the crew, our fellow guests and all the activities that were on offer during our trip! I truly would love to do this one all over again! The cruise itself was a splurge, pretty expensive by Vietnamese standards, but truly it was worth every dollar spent! No comparison! This cruise by far our favourite! Now I realize that a bathroom might seem a bit random here. 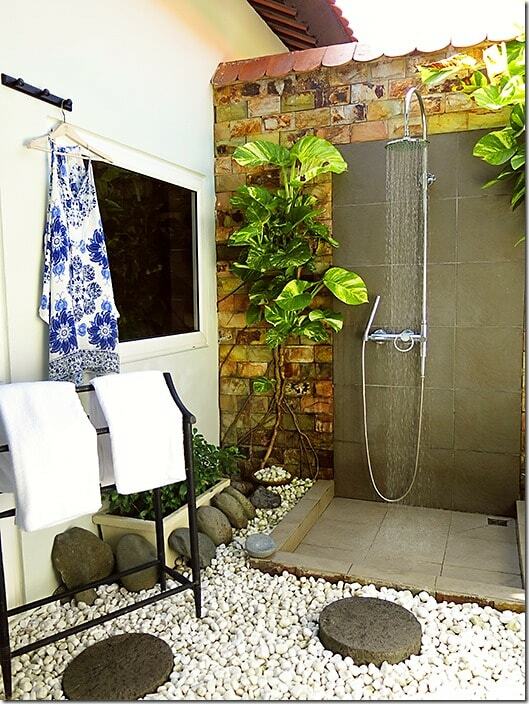 But you know what, I fell in love with this outdoor bathroom at our resort in Hoi An (Vietnam). There is something truly satisfying and ‘free-ing’ about showering outdoors in the fresh cool breeze! It was my first outdoor bathroom experience and it sure impressed me! So much so that I had to include it on our favourite list! Now if any of you feel inclined to come over and build me one of these here at home …. I’m not going to say ‘no’. How awesome would life be if you could freshen up every morning with the sun shining down on you (instead of our bathroom which does not even have a single window!!! argh!! If you would like to read more about this incredible resort, hope over to our post ‘Checking in to the ultra luxurious Victoria Hoi An Beach Resort & Spa’. If you would like to book a stay at this resort, click here*. Our adventure on Fraser Island in Australia was another top favourite! This island is so unique and filled with so many natural wonders! It is no wonder that this island has been given World Heritage Site status! This photo above was taken at Lake Birrabeen! The shades of these lakes on this island are just incredible! The whitest sand against the turquoise waters! Not even to mention that we were pretty much the only visitors to this lake on the day! Read more about the ‘Top 5 Untouched places to discover on the inland tracks of Fraser Island’ here. We love our hikes. 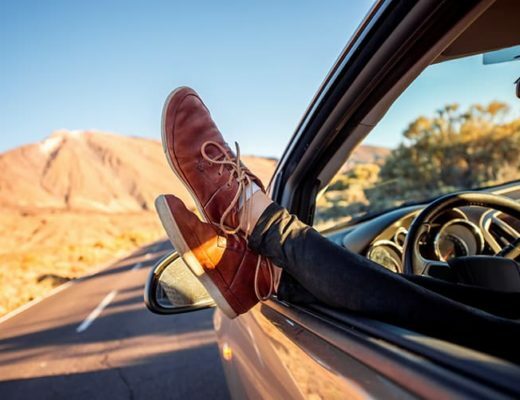 We love moving on holidays, sitting still was never meant for us! We want to explore, discover and experience! So this 4 hour hike in Sapa was a hot favourite for 2015. We hiked from the top of Sapa town down through the valleys of rice paddies all the way down to the minority villages located at the bottom. Our guides were full of stories to tell, even stopping to show us the plants they use to dye their clothes, or which leaves to use to stop nausea. The scenery around us was purely sensational! The culture found in the minority village was incredibly interesting! 12km of hiking on some pretty muddy terrain! But gosh what an experience!!! 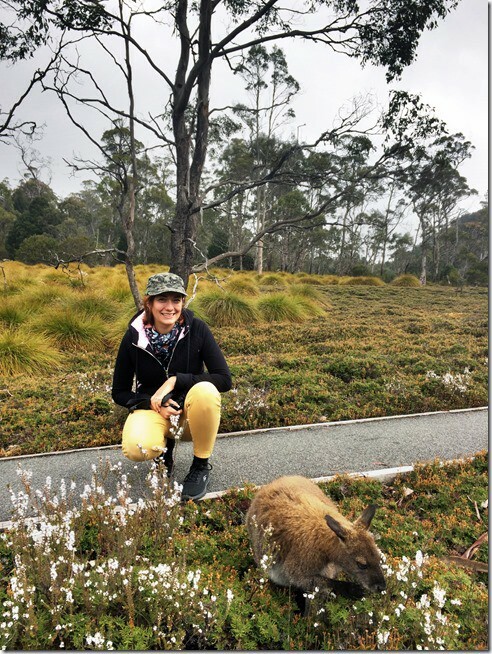 I don’t think we have ever seen as much wildlife about as we did in Tasmania, Australia. Unfortunately a lot of the wildlife we saw were road kill, it was a bit hard to absorb! But not to fret, we saw lots of alive wildlife too! From Wallabies, Wombats, Wild Cats, Whales, Seals, Albatross, Pademelon to Possum! It was great to walk around Cradle Mountain where we discovered this beauty above! We also got up close to a number of Wombats, they are too cute!! I had only ever seen Wombats before in Zoo’s, and usually they were asleep in a log, so it was fabulous to see them wandering around for food in the very late afternoon. We were pretty afraid of giving this ‘Egg Coffee' a go. I mean come-on, egg in coffee doesn't exactly sound like a match made in heaven! But we did, and I'm so glad we gave it a go as it was so delicious and so luxurious and luscious that we went back for more and more and more!! You can find Egg Coffee in Hanoi, Vietnam and we urge you to be brave and give it a go!! Food! Food is one of the things I love about travel! Learning about new tastes and new flavours and new ways of cooking! We definitely fell in love with the Vietnamese cuisine, each region so different to each other! Here in South Vietnam in Ho Chi Mihn City we had one of our best meals! Apparently, this restaurant is so popular that even Brad Pitt and Angelina Jolie has had a meal here! Or so they say anyways! 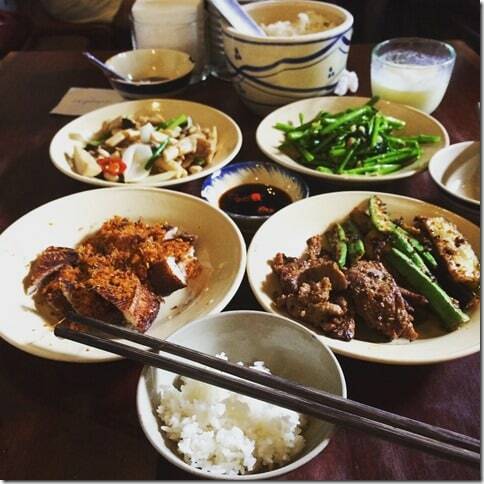 A delicious selection of typical Vietnamese style food at Cuc Gach Quan. It was YUMMMM! And that concludes our year in review! Favourite destination of the year? Most definitely, hands-down, Vietnam! What a beautiful incredible country!! Second in line? 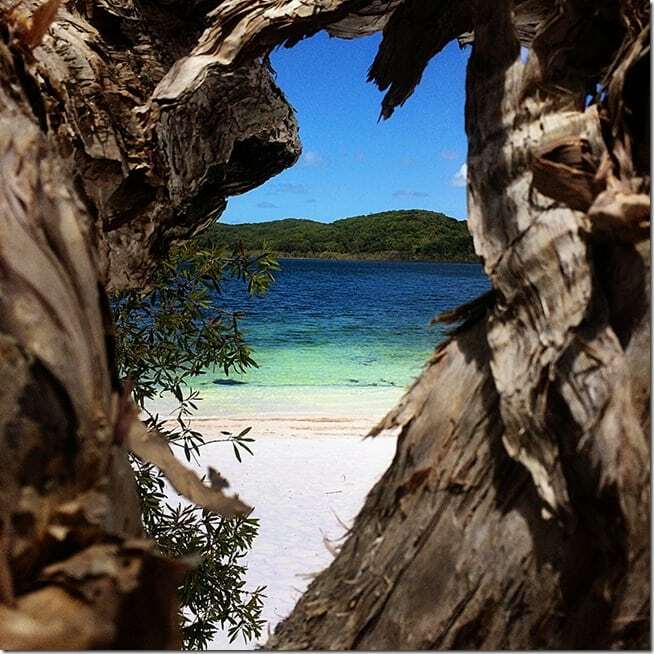 Definitely the magical Fraser Island in Australia! We are excited about new adventures in 2016 and in our next post we will share some of our travel plans with you all!! * Denotes affiliates links. Using our links costs you nothing extra but helps us stay in business! Please see our disclaimer page for more information!